Paso feels like it’s been the same for the last 40 years. I mean that in a good way. It’s got small town blue collar charm, and the wineries are tucked away like treasures amongst farmland and forests. Of course, this statement is far from the truth: Paso has changed a lot. In the past 20 years, winery growth has exploded 500%, and you can see new places popping up in the downtown every time you look up. But there’s a pride to the way things are done here. It’s farm to table because it’s a farm community and it always has been, not because America demanded it. There’s pride in the local wine. Paso believes it can stand toe to toe with the Napa’s and Sonoma’s of the world. It’s young in spirit, but rooted in tradition. Sure “Southern Rhone Blends” don’t sound as majestic as “Cabernet Sauvignon” and “Chardonnay”, but that’s mostly due to our American upbringing. We name our wines based on grapes: the old world names them based on place. The french don’t say I want a southern Rhone blend, they say I want a Châteauneuf-du-Pape or a Gigondas (places in southern Rhone in France). All of a sudden they sound a lot more elegant huh? 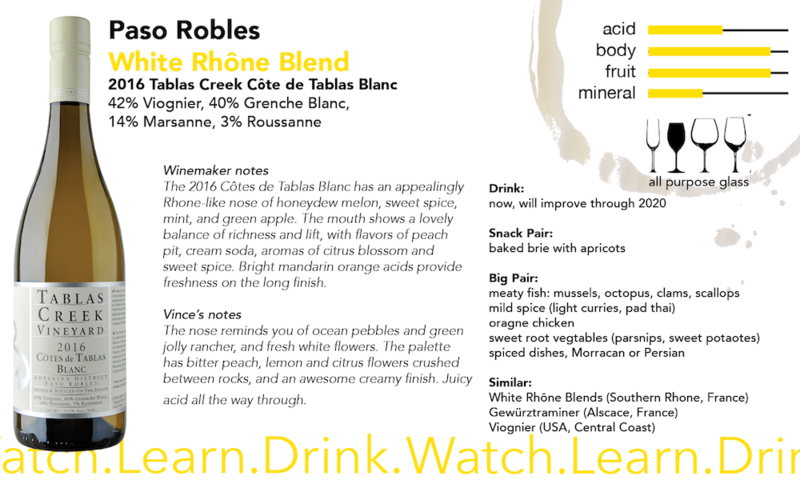 White Rhone Blends are full of some obscure grapes. You can use a bunch of different grapes, but the most common are Viognier, Grenache Blanc, Marsanne and Roussanne. The cool things about Rhone Blends is the weaknesses of some grapes can be masked by the strengths of others. So Viognier is floral and aromatic, but has low acidity. Cue the Grenache Blanc. A little M and R (Marsanne and Roussanne) for some lush fruit, and bam! The blend is born. Grenache, Syrah, Mourvèdre. The most common red Rhone blend. For good reason; they all play nice. Grenache is the fruit and body, Syrah is the spice and complexity, and Mourvèdre is the tannin and finish. Have you ever seen a “Cote de Rhone” in the wine shop? They make oceans of the stuff, so a lot of it is exported here. Most of those are GSMs! Neil Collins, winemaker for Tablas Creek, is the quintessential example of a guy who caught the winemaking bug and never left. He uprooted his entire life to come to America to make wine. He’s managed the vines at Tablas Creek Vineyards for as long as they’ve been around, and lives on property. Which is good, because continuity is good. We like a guy who knows what’s coming each year, especially in a winery that specializes in blending: blending is a practice makes perfect kind of thing. Before tasting the wines, I went out into the field with Tables shepherd, Nathan; and his two dogs of course. He explained to me how he hopes the biodynamic farming he is helping build will not only make better product, but leave an impact after he’s gone. Oh, and there were adorable baby sheep involved. Jason Haas is the current GM of Tablas. His father Robert, along with the Perrin family (wine royalty: the family behind the famous Chateau Beaucastel in France) founded Tablas as a means to champion the Rhône blend and grapes in the new wine world. They could have easily sold out and produced more lucrative Cabernet’s, but they stuck to the plan. They searched high and low for the perfect spot, and found it in Paso Robles. 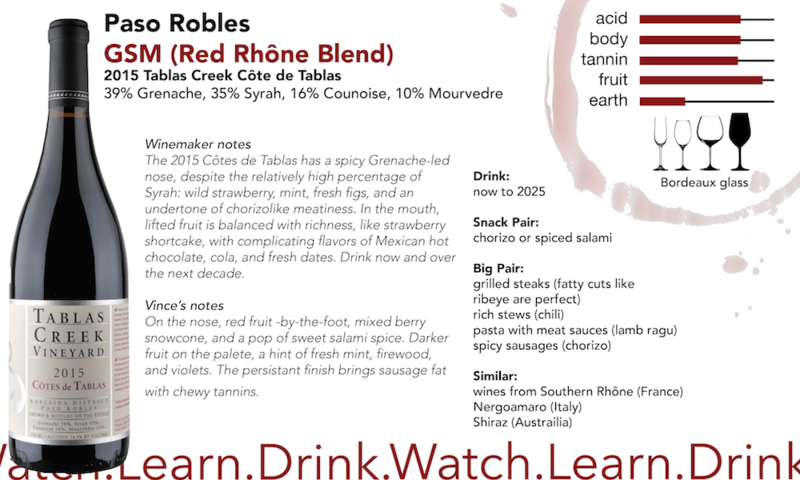 20 years later, you can’t talk about Rhône in America without mentioning Tablas Creek. Artisan is run by the husband and wife team Garrett and Jenn. In the same way that Colin left the UK, Garrett and Jenn (who is former Miss California I might add) did their own relocating from Orange county to Paso Robles; which, if you’ve been to both, couldn’t be more different. But they loved the lifestyle. They got married in Paso. They wanted to raise their kids in Paso. And so when the opportunity arose to run Artisan, they jumped at it. And they’ve built a restaurant that not only helped start the resurgence of the downtown area, but helps continue to push it forward. Chef Ryan Caveywoolpert runs us through dishes that stay as close to Paso as possible. Everything that can be local, is. And just like our wine, the dishes have layers: spicy, acid, sweet, crunchy, soft, herbal, fresh. 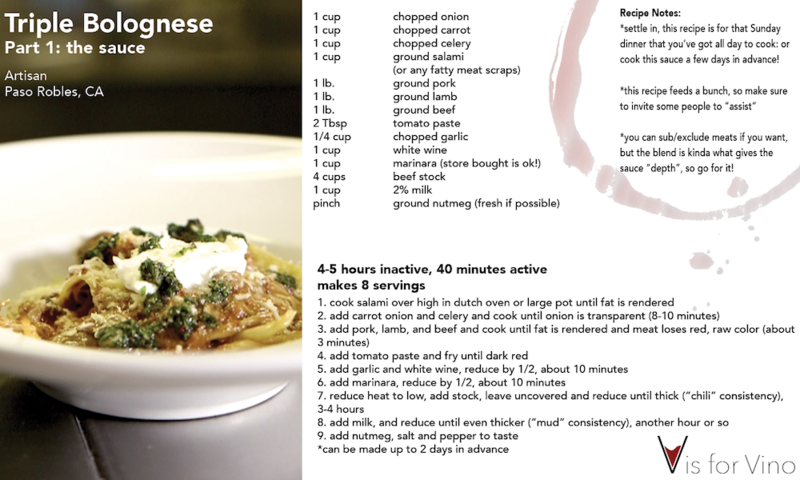 Let’s just say this isn’t you mother’s bolognese. 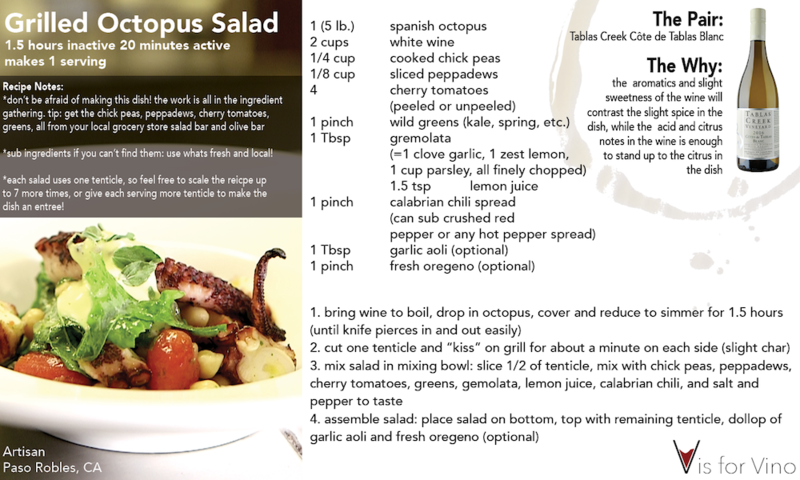 Or octopus salad. If your mom made octopus salad when you were growing up. It’s the special sauce. The little something extra. The magic medicine. Terroir is that intangible aspect that makes wine different from so many other consumables. It’s the combination of factors that makes the little piece of land the vines are planted in different from the pieces of land, and able to grow grapes that are worth a damn. It’s the reason when it comes to winemaking, I can say “don’t try this at home, kids”. No, this isn’t high school chemistry. This is wine. And acid is, IMHO, the most important element of wine because it is so essential to wine having the ability to pair with food. 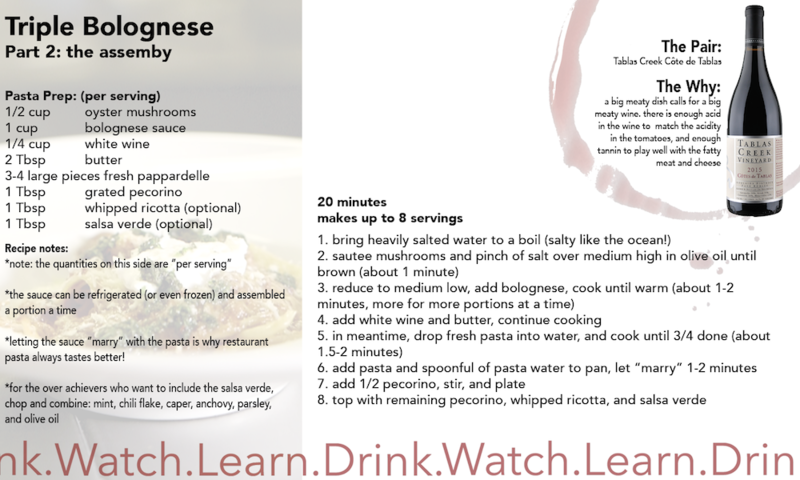 See, a wine’s acidity needs to match a dish’s acidity to pair properly before you can even think about other pairing factors. And almost all dishes have a fair amount of acid; citrus, vinegars, tomatoes and fruits, many wheats, are all culprits. Acid gives the wine focus, pop, and zing (and other batman comic-esq onomatopoeia). Watch the “Nerd Lab” to learn where it comes from, and how a winemaker has to pick grapes at the proper time to find the right balance of acid (which stays in the final wine) and sugar (which eventually turns to alcohol).